Enveloped, spherical to pleomorphic, 150 nm in diameter, T=16 icoseadral symmetry. Capsid consists of 162 capsomers. Glycoproteins complexes are embeded in the lipid envelope. Monopartite, linear, dsDNA genome of 212 kb. The genome contains terminal and internal reiterated sequences. 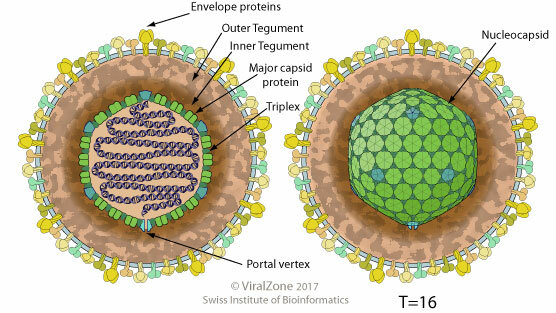 Virus attaches to host receptors through surface glycoproteins.